Enchanted Disney Princess 1/20 CT. T.W. Diamond Castle Key Pendant in Sterling Silver - 19"
Enchanted Disney Merida Pear-Shaped Blue Topaz and 1/20 CT. T.W. Diamond Bow and Arrow Pendant in Sterling Silver - 19"
Enchanted Disney Belle Diamond Accent Rose in Glass Dome Pendant in Sterling Silver and 10K Rose Gold - 24"
Enchanted Disney Villains Maleficent 1/10 CT. T.W. Diamond Thorn Pendant in Sterling Silver with Black Rhodium - 19"
Enchanted Disney Villains Jafar 1/10 CT. T.W. Diamond Snake Pendant in Sterling Silver with Black Rhodium - 19"
Enchanted Disney Villains Evil Queen Garnet and Enhanced Black Diamond Accent Pendant in Black Sterling Silver - 19"
Enchanted Disney Cinderella Oval London Blue Topaz and 1/10 CT. T.W. Diamond Carriage Pendant in Sterling Silver - 19"
Enchanted Disney Jasmine Diamond Accent "Choose Wisely" Disc Pendant in 10K Gold - 19"
Enchanted Disney Elsa 5.0mm Aquamarine and 1/10 CT. T.W. Diamond Key Pendant in Sterling Silver - 19"
Enchanted Disney Tinker Bell Tourmaline and 1/10 CT. T.W. 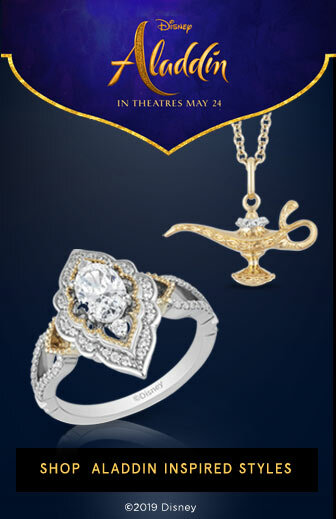 Diamond Pendant in Sterling Silver and 10K Gold Plate - 19"
Enchanted Disney Cinderella 1/10 CT. T.W. Diamond Slipper Pendant in Sterling Silver and 10K Rose Gold - 19"
Enchanted Disney Mulan Pear-Shaped Garnet and 1/10 CT. T.W. Diamond Pagoda Pendant in Sterling Silver - 19"